My husband, Paul, is a good guy. But efficiency isn't one of his strengths. For example, the Christmas wreath you see on the front of our log home...well...it's been up there for over a year now. Our neighbor, J.P., called us up a few weeks ago and said, "You tell Paul congratulations on being festive so early this year". She's been picking on him all year about the wreath. And she's not the only one. Last night he finally plugged it in and half the lights are burnt out on one side. So what we have is a huge "C" when it's plugged in. That would be just perfect if our last name started with the letter "C" but it doesn't. I'm waiting for it to freeze solid so I can pry it off the deck without a mess. 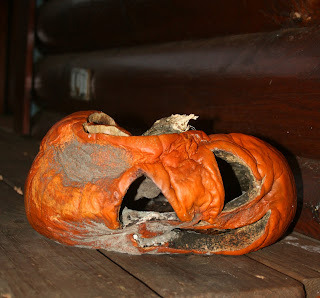 Maybe next year we should put the pumpkin out in early September so that it looks this way on Halloween. After all, the pumpkin has only gotten scarier with age!